Happy New Year's Eve! We've been here less than a month and have already bought more than 600 pieces! We're focussing this trip on deepening our relationships with the 2 main groups that we have bought naturally dyed silk and cotton textiles from on past trips: Prae Pan Group in Khon Kaen province and Panmai in Surin, Si Saket and Roi Et provinces -- all in Isaan, the Northeast of Thailand. As well, we are seeking out new producer groups with whom we could establish fair trade relationships. (See our page on Fair Trade in the main part of our website for more info on this.) This has proven to be an interesting task. Before we left Canada, we did as much research as possible to help us plan our trip. One stop that we knew would be important for us was to go to the OTOP CITY fair in mid-December in a huge convention/trade centre in Bangkok. First, let me tell you more about our experiences in Chiang Mai. As well as meeting Fai Gaem Mai (see the first post), we learned about a group of weavers whose families were dealing with HIV/AIDS. We went to find them at the annual Gift Fair 2007 in Chiang Mai. This large event was filled with food, crafts and textiles. The textiles were grouped in several large, open tent areas, perhaps 200 hundred stalls in all. After half a day of wandering (and buying from a couple of other vendors, including a woman with a family business that produces lovely batik hemp table runners), we finally found the Information Desk, as our efforts to find this particular group of weavers were not working. In spite of Alleson's ability to speak some Thai, we were not able to locate them by name or phone number on the pages-long list of vendors we found at the Information Desk. This proved to be the beginning of challenges we continue to face when trying to find specific groups. We finally left the Gift Fair with some , but none from the group we were looking for.Our next search was to the weekly Chiang Mai Sunday Walking Market, a very fun, long-standing outdoor market held each Sunday afternoon and on into the evening. It covers blocks and blocks, and people sell anything from textiles to T-shirts, crafts to paintings. Some are made by local artisans; much has been bought elsewhere. We were looking for a woman we met last year who, with her family, weaves 100% cotton, naturally dyed scarves. The scarves we purchased some from her last year sold quickly so we wanted to find her and talk more with her about who makes the scarves. 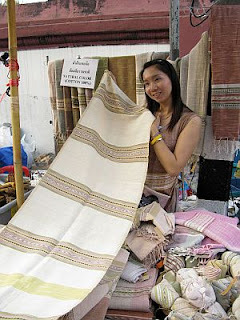 The Klong Jing weaving group is a village-based family business, made up of 20 extended family members. They weave from December to February when not busy with rice farming, their main occupation, and again in August during rainy season. They use only natural dyes made from barks and leaves, and weave in 100% cotton (which is a much cheaper investment for the weaver than silk). It takes a day to weave a table runner, but 3-4 loose weave scarves can be woven in a day. We bought many of these scarves, lovely for casual wearing -- they'll look great with jeans!Does this group of weavers fit the standard definition of "fair trade" groups with whom we want to trade? Are we able to learn enough about the ways they set payment for the work to those who produce it and under what conditions? What can we learn about how they work in ways that protect their health and their local environments? We are discovering that there is no single way that weavers organize themselves. Unlike coffee farmers, who have been in the forefront of the fair trade movement, organizing themselves in a farmer-run, co-operative model, we are encountering many types of groups in Thailand. We have been fortunate to meet a number of women who are part of a strong network of rural women's development workers. They are helping us learn which groups most benefit the members and therefore with which we want to develop long-term trading relationships. As we continue to build our network, we will be working more often with these women to help us make these decisions. We feel very fortunate to have the opportunity to work with these highly skilled, dedicated and fun women. "SUPPORT was established in 1976 under Her Majesty's royal patronage, partly through funds supplied by Her Majesty and partly with public donations. SUPPORT's primary objective is to set up women's groups and provide rural Thai women with equipment, materials, and training in cottage industries. The latter include some 18 traditional crafts which Her Majesty felt were worthy of being promoted on both local and world markets..."Although we weren't buying from a weaving co-op directly, we liked the approach and bought many naturally dyed, loosely woven, cotton scarves, along with a wonderful array of reverse applique pieces. I am particularly drawn to the tiny stitches and interesting, often geometric shapes used in this work. Although not naturally dyed, I know that many quilters and sewers will appreciate and find uses for these beautiful pieces. Delving deeper into the opportunities Chiang Mai has to offer, we were delighted to discover and attend His Majesty the King's Doi Kham Royal Projects Fair, where we bought many scarves produced by village groups in the North of Thailand. Again, we didn't buy directly from the weavers, but as we weren't able to visit these weavers directly, we wanted to support their work and found some lovely textiles. The King's Royal Projects have helped hilltribe groups in the North replace opium crops with other income-producing crops and crafts. You can learn more here, if you're interested: http://www.royalprojectthailand.com/general/english/index.html. Our next stop: 3 days at the OTOP CITY fair in Bangkok. Alleson will post her entry about the Eri silk group visit soon and we'll take you to Khon Kaen on our 3-day visit and training with Prae Pan Group. Drop by again for these and other postings.